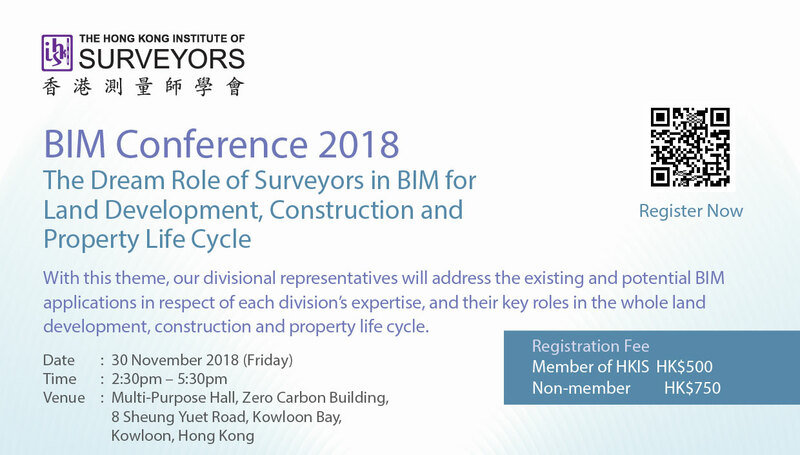 AIA Hong Kong invites you to join The Hong Kong Institute of Surverors (HKIS) BIM Conference 2018 –The Dream Role of Surveyors in BIM for Land Development, Construction and Property Life Cycle. This event will be held at the Zero Carbon Building, Kowloon Bay, on Friday, November 30, 2018 commencing at 2:30 pm and will focus on the challenges and future potential of BIM in the building industry. Divisional representatives from across all HKIS divisions will address existing and potential BIM applications in respect of each division’s expertise, and their key roles in the land development, construction and property life cycle, as well as future possibilities for this technology in the digital era. The Conference will present golden opportunities for companies in the property and other sectors, and your participation will be greatly appreciated. AIA Hong Kong is a supporting organization for this important event.